Note: This is a guest post by Enroll Nebraska intern Tori Olson. Enroll Nebraska partnered with United Way of the Midland’s 2-1-1 Call Center for the Health Insurance Marketplace open enrollment period from November 2016 – January 2017. When callers accessed the free referral service by phone, 2-1-1 played an automated message suggesting the caller ask their live receptionist for a referral to a free health insurance enrollment assistance appointment. 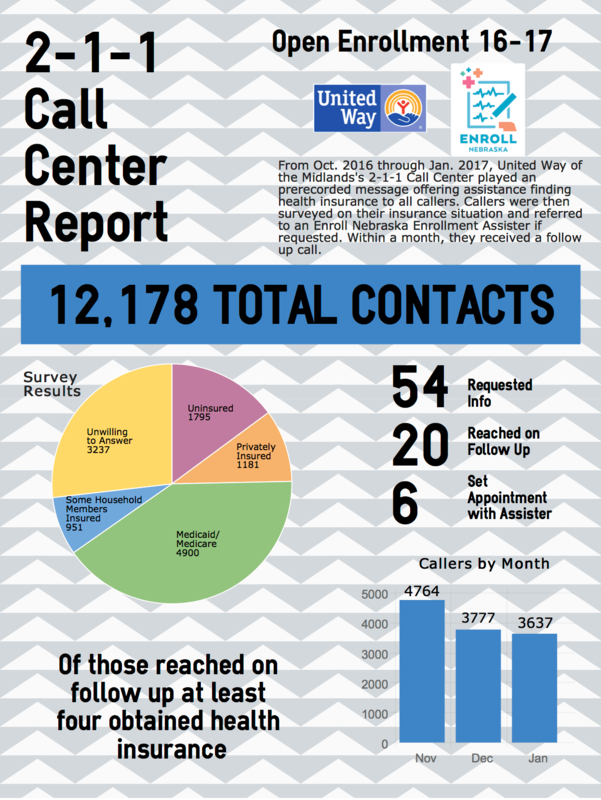 This innovative 2-1-1 partnership was able to inform Nebraskans about their health insurance options 12,178 times during the enrollment period resulting in 54 people requesting a referral. On follow up, 2-1-1 determined that at least four people or families were able to gain health insurance because of these efforts. Enroll Nebraska appreciates the opportunity to work with 2-1-1 and their efforts to help more Nebraskans find the health insurance they need. For more information about 2-1-1 and their vital services to the community, please visit www.ne211.org. People who have experienced a major life change such as marriage, divorce, birth of a child, or changing jobs can still find referrals for enrollment assistance by calling 2-1-1 or visiting www.enrollnebraska.org/local.